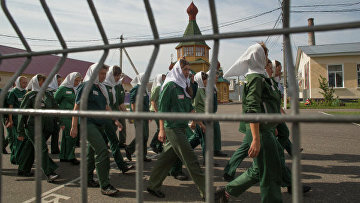 Russian MPs endorse certain prison conditions for terror convicts | Russian Legal Information Agency (RAPSI). MOSCOW, December 19 (RAPSI) – The State Duma MPs adopted in a final third reading on Wednesday a package of draft laws aimed to prevent the spreading of radical extremist ideologies in places of confinement. According to the bills, persons sentenced for terrorism would serve certain time of their punishment in prisons instead of penal colonies. Ward treatment, it is believed, will help to minimize the spread of extremism among convicts and the scale of their recruiting to terrorist organizations when in confinement. At present those convicted of aggravated terrorism- and extremism-related crimes may be put to serve time in minimum- to maximum-security correctional facilities, where the communications among convicts are less restricted, whereas in prisons they are confined in small groups. The bills’ authors envisage that terrorism-related offences should be put on the list of especially dangerous crimes punishable in certain cases with confinement in prisons, whereas for gravest crimes of this nature there should be established a statutory rule envisaging service of the greater part of the term of sentence in prison. The Federal Penitentiary Service (FSIN) would be authorized to transfer the persons engaged in the propaganda of terrorism among other convicts to other penal facilities under the same regime, the bills read. Besides, the authors believe, the persons sentenced for organization of illegal armed groups and banditry should be excluded from the effect of envisaged by the law factors allowing to shorten their time of punishment. Amendments are proposed to Russia’s Criminal and Penal Codes.